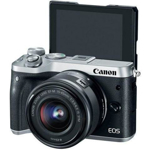 Canon EOS M6 + 15-45 Expert Reviews - Read Reviews and Buy Smarter Online. Verdict: ^ Compatible with select smartphone and tablet devices (Android™ version 5.0 or later and the following iOS® devices: iPhone 4s or later, iPad 3rd gen. or later, iPod Touch 5th gen. or later) equipped with Bluetooth® version 4.0 or later and the Camera Connect App Ver. 2.0.20. Verdict: The Canon EOS M6 isn't quite specified up to the standard we'd expect for a camera with such a price tag, but it's a sound all-round performer and perfectly good choice for EOS M and EOS M10 users looking for something a little more powerful. Verdict: Despite Canon's continued dominance of the DSLR market, as well as a strong performance in the premium compact sector, its CSC range has had a relatively unremarkable start, with only four UK models released over a five-year period. Verdict: I must say that like many cameras these days the Canon M6 is perhaps overloaded with options and at first blush some potential users will be overwhelmed and even put off by the maxed out features, especially when bravely plowing through the online instruction manual. Verdict: Sorry, I had to say good bye to my Sony a6300. I didn't see the need to keep both camera. Although the Sony a6300 is a great 4K camera with stunning visuals, I really needed a vlogging camera with an articulated LCD screen, and the Canon EOS M6 is the perfect choice for me. Verdict: DSLRs and mirrorless camera are all the rage these days, but what if you just wanted a simple compact solution that isn't complicated to operate? Sure, your smartphone might provide a decent option, but not all smartphones these days have that great of a shooter. Verdict: The 24-megapixel APS-C image sensor and DIGIC 7 image processor help deliver good image quality and impressive overall performance, but the Canon EOS M6 has to separate itself from not only its EOS M5 sibling but very good mirrorless cameras from numerous other manufacturers. Verdict: If this camera had had the same sensor as the Canon 6D, prime lenses, and better autofocus, I would've easily given it five stars. But oddly enough, it has more megapixels than the 6D and not as great as an output as that camera despite being a significantly newer sensor. Verdict: Canon announced the EOS M6 back in February 2017 and it's now available in the Philippines this month. It's actually a quick follow-up to the Canon EOS M5 that was announced in September 2016 and released in the Philippines around December 2016. Verdict: Canon's current generation of mirrorless cameras deliver serious improvements compared with earlier efforts, but they still have some room for improvement. The EOS M6 is solidly built and compact, with appropriately sized lenses to go along with it. Verdict: The Canon EOS M6 was enjoyable to take out for a few days of shooting, and its image quality is plenty good enough for everyday photography needs. As is typical with Canon's mirrorless cameras, the image quality in the M6 is really good, with realistic colors and just the right contrast level. Verdict: The Canon take on the mirrorless camera market has been interesting: having lackadaisically introduced the M-series system in a bid to avoid undercutting its own DSLR business, it had taken Canon years to establish a more viable M-series camera. That happened in 2016 with the EOS M5 . Verdict: Canon continues to develop its EOS M range of compact system cameras (CSC) through the EOS M6, a diminutive camera packed with the sort of features one would expect from a Canon DSLR. Verdict: The EOS M6 reaffirms Canon's commitment to enthusiast-level mirrorless cameras. Verdict: Promoted by Canon as 'The Content Creator's Mirrorless', the EOS M6 updates its predecessor, the EOS M3 by importing some of the advanced features introduced in the EOS M5 (which we reviewed in December 2016). Verdict: In conjunction with Canon's 30th Anniversary this year, Canon Marketing Malaysia has released three new DSLRs - the Canon EOS 77D , EOS 800D , and the mirrorless EOS M6 into our market. They are all available right now in all Canon Image Square and authorized dealers nationwide. Verdict: A fine camera for those entering the world of mirrorless with changeable lenses. Not as compact as some might want in a travel point and shoot, and the wi-fi connect is a bit clunky, but for the current price and features it holds a favorable place many will appreciate and value. Verdict: Nice camera,light,easy to use! Verdict: I purchased this camera in November 2017, hoping for a dSLR quality camera in a smaller, lighter weight package. It is smaller and somewhat lighter, but much poorer quality than a regular dSLR. Verdict: This camera is amazing. Only issue I've had is the little remote that comes with this package doesn't work and I've checked all the settings on the camera twice. Verdict: Quality of a 7D mk ii or 80d packed into a beautiful little camera, only downside is the lack of viewfinder, however, for video work it functions perfectly for 1080p, the powerful 24mp sensor also makes for some beautiful detailed pictures. Highly recommended! Verdict: I have owned many DSLRs in my professional production business for broadcast, event, commercial, docu, and cinema, and beyond the shadow of a doubt this small lightweight, easy to use camera is the first breath of air Ive had in a long time. Verdict: I am a travel and street photographer. I have no interest in the SLR style camera. What I was looking for was good image quality and the APSc size and weight. Over some other brands, the current Canon lenses are few, but the ones available are very good. I keep the 22 on 90% of the time. Verdict: Brilliant Small Camera with most EOS SLR features and programs. I t can be hard to see the LCD screen sometimes, but after purchasing the EVF-DC2 Electronic Viewfinder Accessory, I am now really happy using this camera in very sunny conditions. Verdict: I mainly shoot with Canon DSLRs, also own another brand mirrorless camera and was curious about what progress Canon was making in the mirrorless product space so on an impulse I bought the M6. Verdict: This is a great camera from Canon. It feels comfortable and well balanced in the hand. The rear touch screen is detailed, large and easy to use. It also tilts 45 degrees which I also found really useful.